Come share your talents in the beauty and culture of the Fijian Islands. Whether you are in a medical specialty, a teacher or student, or just someone with a heart to serve, there is a place for you at the Mission at Natuvu Creek. Scroll down to learn more! 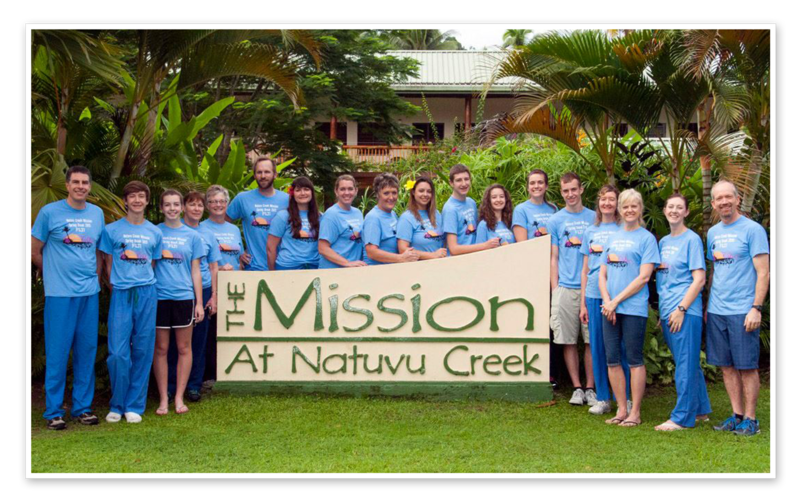 The Mission at Natuvu Creek Welcomes You! The Mission is truly an experience of a lifetime and we are certain that you will enjoy every moment of your stay with us. Below you can find detailed information about the Mission and making a trip, including a cost estimate. 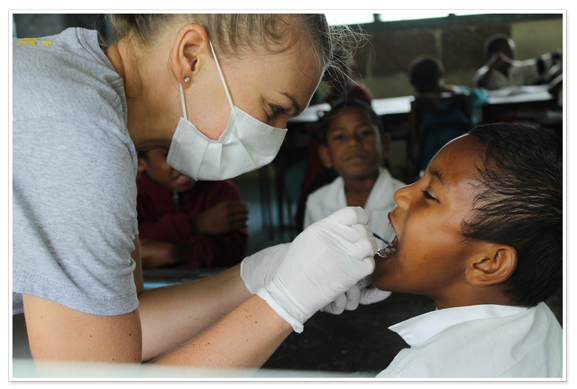 World Class Medicine: One of the most effective ways to serve the people of Fiji is by caring for their physical health. Many health problems that would otherwise be permanently debilitating, such as skin diseases and cataracts, are relatively simple to cure at the clinic. 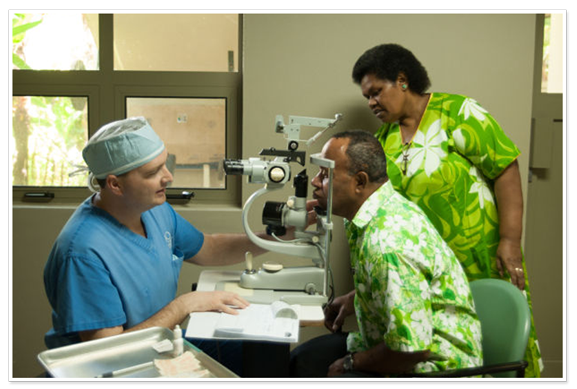 Through the generosity of medical professionals and volunteers alike, our Ministry of Medicine offers free medical care in a modern medical facility to rural Fijians. 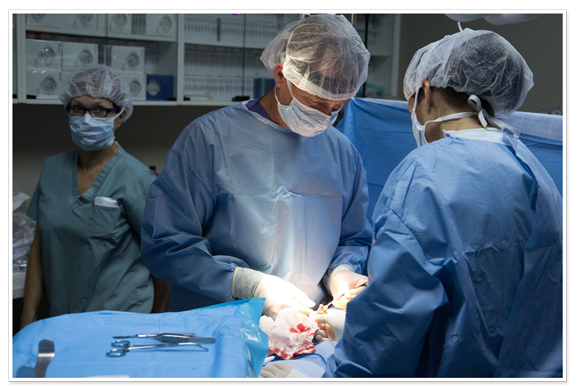 We can accommodate all medical and dental services, including surgical services, that are done on an outpatient basis. 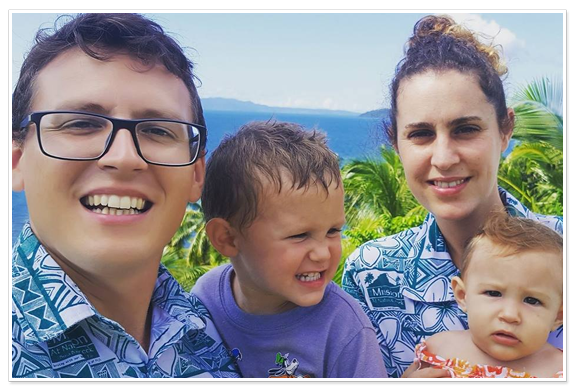 Managed by our onsite resident directors, Dr. Denis Kalbermatter (a registered nurse and dentist), and his wife, Ornella, our 7,000 sq. ft. facility operates year-round. Our clinic is well-appointed with a dental room with 4 chairs, several exam rooms for general exams or eye examinations, and an out-patient surgery suite with a pre/post op room. Available equipment includes a full eye exam center, equipment for producing prescription eyeglasses, a surgical microscope, dental chairs, pneumatic and other dental instruments, an x-ray machine, general anesthesia equipment, and equipment for a more surgical theater.Our staff includes administrators, orderlies, and facilities staff to help manage patient flow and keep the operation running smoothly. Clinic days are typically Monday through Thursday from 8:00 am to 4:30 pm and Friday 8:00 am – 1:00 pm. While the Mission strives to equip the clinic as completely as possible, medical teams can help by bringing the specialized equipment and materials they need, as well as medications and supplies to stock our pharmacy. We are happy to provide the most current list of modern equipment that is permanently placed at MNC. Please consider sharing your gifts and your desire to help others by serving at the Mission at Natuvu Creek. 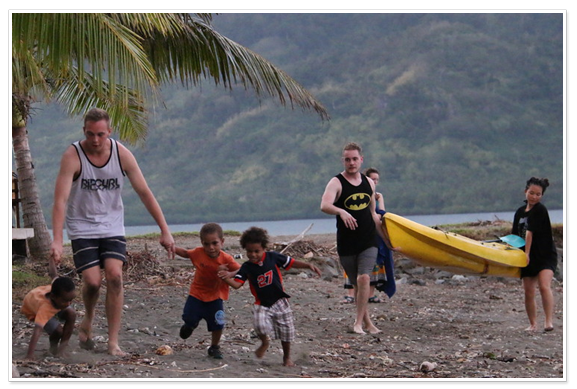 To get to the Mission at Natuvu Creek, there are several 11 hour non-stop overnight flights from Los Angeles to Fiji every week. 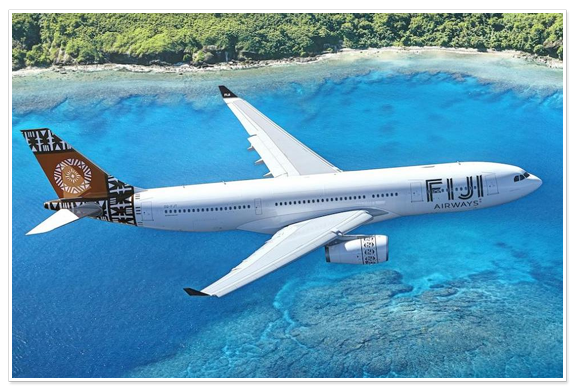 Following your arrival in Fiji, you will fly an additional 1.5 hours on a small domestic flight to one of several smaller island airports, followed by a 2 hour taxi or taxi/boat ride. Our travel coordinate will arrange all travel for volunteers. A valid passport that expires no sooner than 6 months from date of return from Fiji is required. 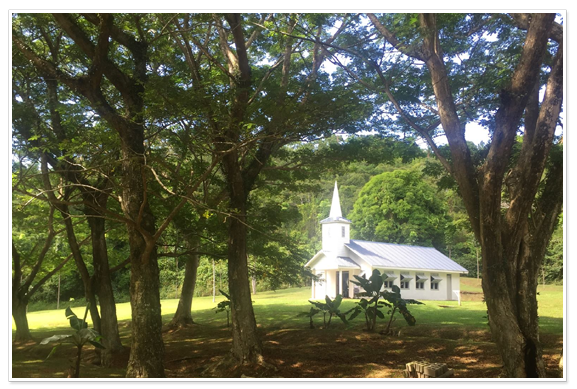 Life at the Mission is wonderfully peaceful and spiritual. The Mission at Natuvu Creek models the example of “healthy living” that we promote, therefore our campus is drug, alcohol and tobacco free. Our volunteer accommodations are lovely, with wi-fi, showers with hot water, and modern flush toilets. 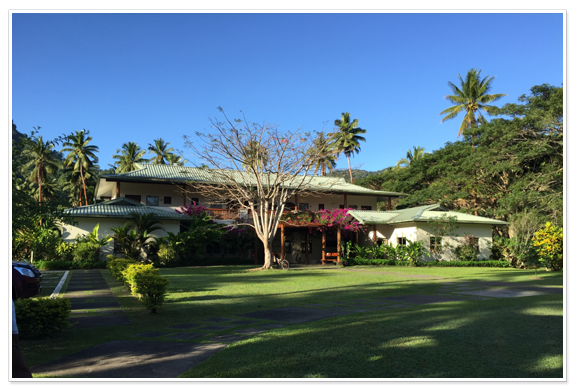 Our location is spectacular, encompassing 750 acres of beautiful beach, rain and bamboo forest and volcano. Our lodging includes three healthy (mostly vegetarian) meals a day and our water source is from the property and double-purified for purity. The rooms are not air-conditioned, but do have fans. 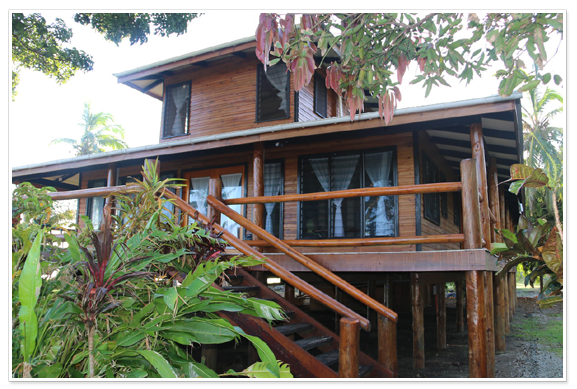 We have dorm housing available as well as private queen suites above the clinic building and we have both private suites and shared rooms in two beach houses, right on the water’s edge. All buildings have beautiful views of the “extinct” volcano, jungle, or ocean. 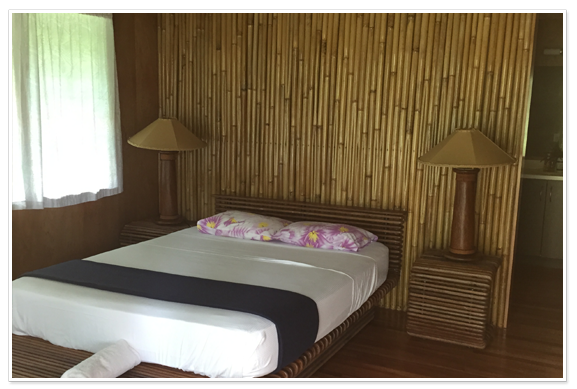 All rooms are are tastefully furnished and have private bathrooms with shower. Between the clinic and the ocean is a beautiful thatch dining area with a modern commercial kitchen. Adjacent to the dining area is a swimming pool that is salt filtered, which is healthier than chlorine and easy on the eyes and hair. To serve our visitors, the local community, and to raise funds for the clinic, the Mission has a small store and gift shop. It offers toiletries and other basic necessities; produce and snack foods; crafts from the local communities and Mission souvenirs. 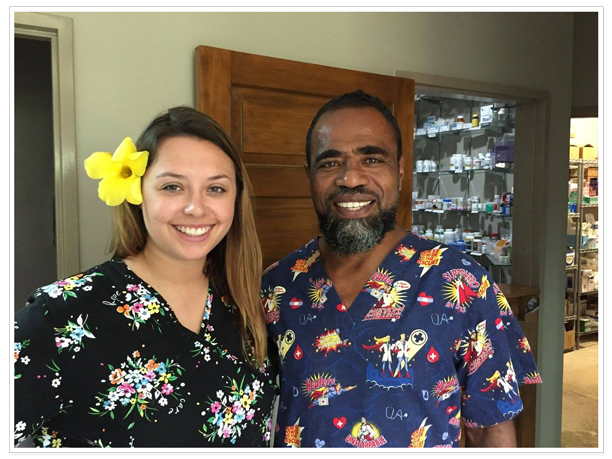 While we are a Christian based Mission, we invite volunteers of any belief system who come with a heart to serve and a respect for the culture and customs of the Fijian people. We have a lovely chapel on the campus and volunteers are welcome to join in for Friday vespers and Sabbath service if they would like. Not included, available for additional fee: Certified or non-certified diving, guided snorkel, fishing, massage, off-site resort stays. $2700.00 per person –dorm-style shared housing or private queen-suite double occupancy in above-clinic housing – one week (7 nights). $2800.00 per person –private queen-suite single occupancy in above-clinic housing, or any beach housing, shared or single – one week (7 nights). *Late booking, name changes, multi-city travel, or U.S. city departures other than LAX may incur an additional airline fee. If you will be booking your own airfare from the U.S., a $1200.00 credit will be applied to your package price. If you are traveling from outside of the U.S., a price reduction will be made accordingly. You may not book independently once a reservation and deposit has been made in your name or if you are part of a group and in doing so will bring your airline group to under 10 passengers. 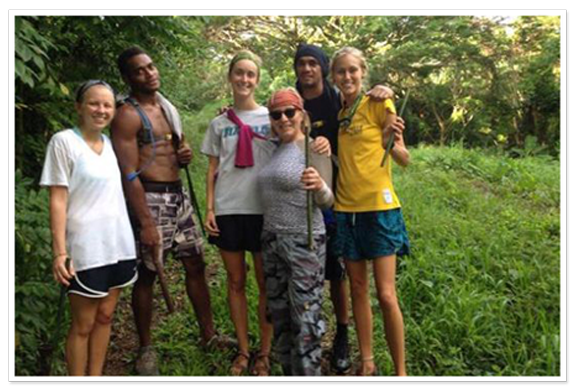 For more information and to schedule your trip, contact our Team Coordinator at: janet@natuvu.org. Scroll down to see what fun activities and excursions are available during your stay! 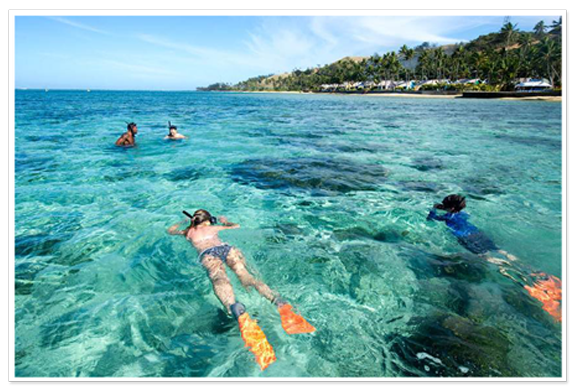 Fiji is without a doubt one of the most beautiful places in the world to visit, with pristine beaches, snorkeling, scuba diving, hiking, natural rock water slides and waterfalls, and lovely cultural excursions. 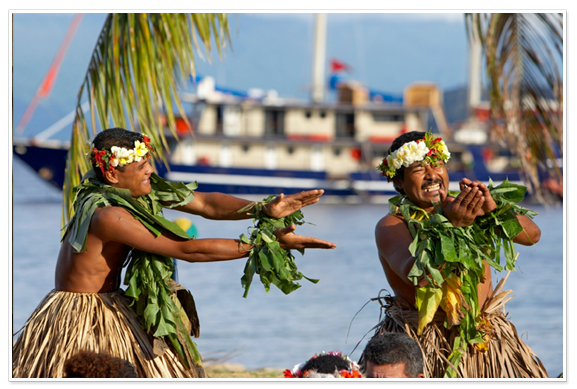 Not only is it beautiful, the Fijian people are likely among the friendliest people you will ever meet, and their traditional song, dance, and cuisine will enchant you. 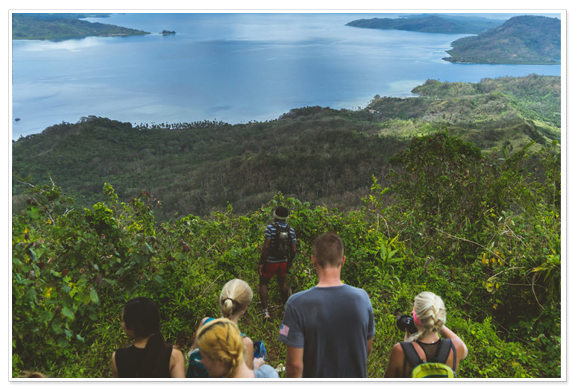 There are lots of wonderful recreational activities and cultural excursions available that will be incorporated in your itinerary and included in your package as time permits. 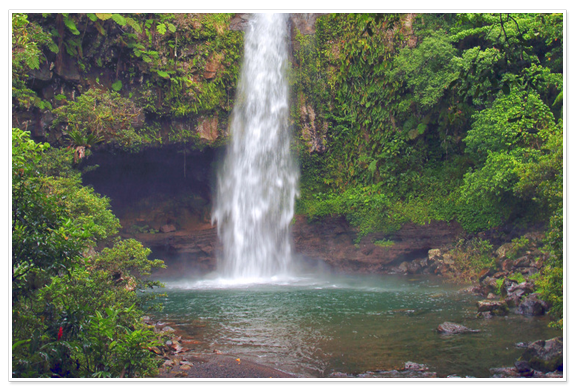 Other excursions can be arranged for you at an additional cost. Hiking : Take an early morning guided hike up to the top of an extinct volcano, right on Mission property. Keep up your energy along the way as you enjoy coconuts, sugarcane, and papaya, and don’t forget to ask for a drink from the indigenous “Watervine” (the freshest water you’ll ever drink). The hike reaches 1,200 feet above sea level and takes 4-5 hours round-trip. 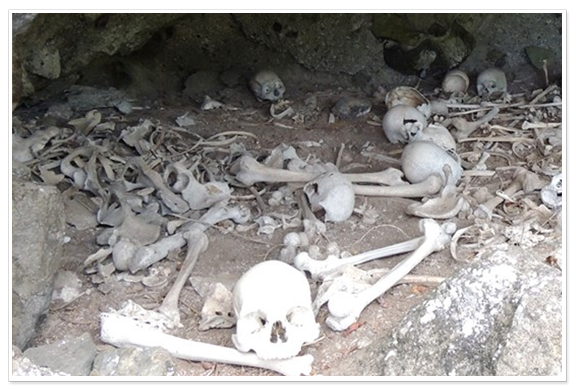 You can also dare to take a challenging guided hike and climb to visit the home of Fiji’s last cannibal tribe, where few people have visited and human bones still litter the caves! We promise… we haven’t lost a volunteer to a cannibal yet! Zipline: Start with a hike and end with a fun zipline ride on our Mission Zipline! 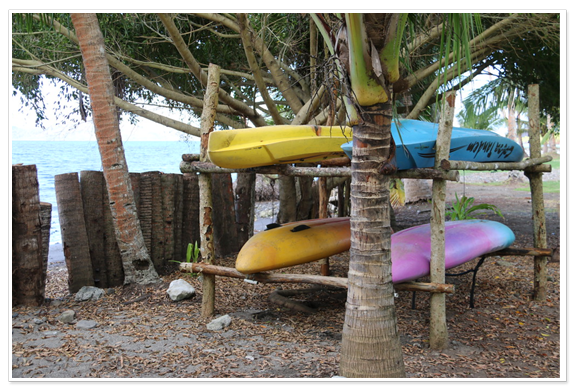 A Day at Rainbow Reef Resort: Know what it’s like to have your own private island! 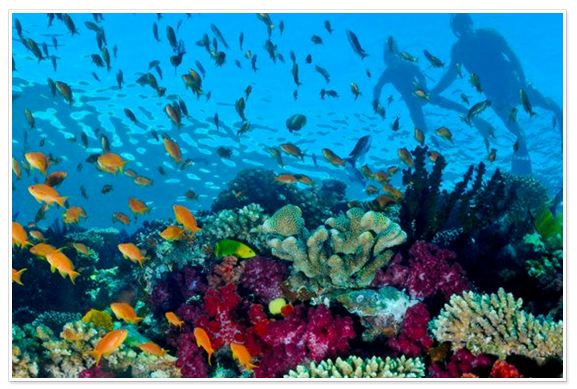 Enjoy the idyllic setting of rainbow reef. Have lunch on the veranda, play volleyball on the professional court, walk the Peacock Trail (where several peacocks live and roam among the fruit trees), discover the lemon trees and private beach at Pirate’s Cove, see hundreds of fish while snorkeling just off the beach, pick a coconut that the staff will open for you, or just take in the perfect wind and waves as you stroll along the soft white sand. (Overnight bookings are also accepted for an extra fee). 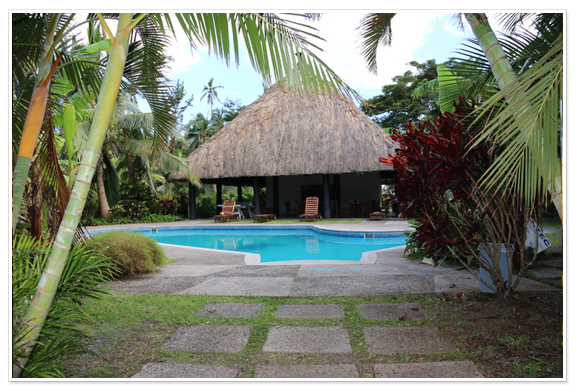 Polynesian Village: Visit the little island of Kioa and get a glimpse of the Tuvalu culture. Settled nearly 70 years ago, approximately 80 families from an island 1000 miles away now live in Kioa. 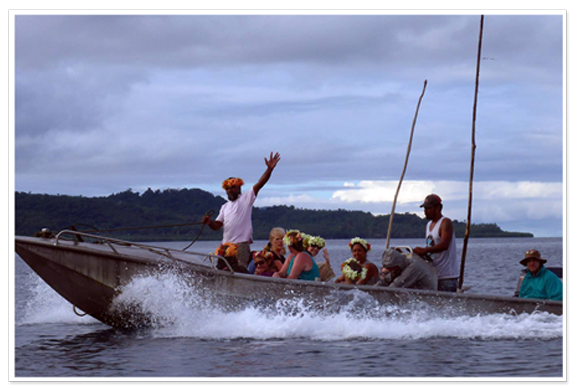 Experience a tour, history discussion, amazing traditional drum and dance show, and have an opportunity to purchase the “handcrafts” of this traditional Polynesian village. Organic Sanctuary: Visit an elevated organic sanctuary with cool eco domes that survived Fiji’s most powerful cyclone and may become a standard of building excellence in Fiji. 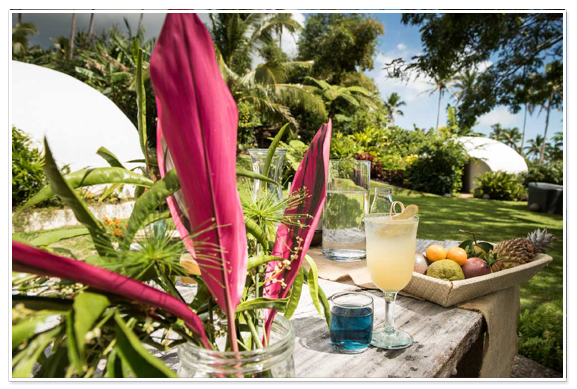 Take a break from the heat and enjoy beautiful sweeping views and upscale refreshments from their organic gardens. Take an educational garden tour, have cooking, coconut or ice cream making demonstrations. 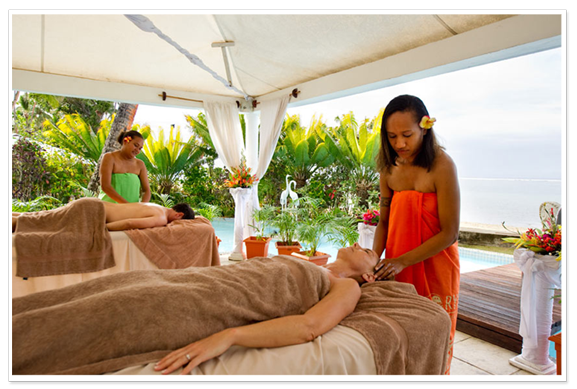 Resort Stays: Interested in a little pre or post clinic R&R? Enjoy one of the beautiful resorts nearby (Extra fee). Check out this birdseye view of the beautiful Rainbow Reef Resort!